We’d love your help. Let us know what’s wrong with this preview of Living Nonviolent Communication by Marshall B. Rosenberg. To ask other readers questions about Living Nonviolent Communication, please sign up. It's a difficult read (for me - because it's not a story) but well worth the time. I needed help speaking with both my son and students in a way that respects and empathizes with their own "stuff" instead of taking things personally. Honestly, I'm just sick of being defensive all the time. I don't have enough practice yet, but I plan to attend some seminars and read all his other books. A world without war. holla. Like Rosenberg's main book, this introduces life-changing theories for how to think and speak. A sequel of sorts to the original, it uses case studies, dialogue to help unpack and explain the value of non-violent communication. I found myself wishing I had obtained the foundation first, which I subsequently did by reading the original. 'Living Nonviolent Communication' brought me a greater perspective on our basic feelings and how to communicate them well. B. Rosenberg explains that we all have different human needs (such as integrity, intimacy, security..) and when we communicate through these needs, we can clear away any communication blockages, end conflicts and fulfill our human needs to greater happiness and wellbeing. 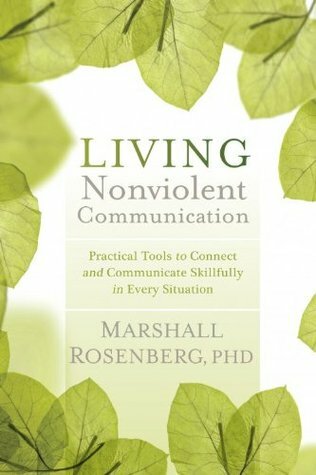 Communicating through our basic human needs and without judgments, manipulation, violence or suppression 'Living Nonviolent Communication' brought me a greater perspective on our basic feelings and how to communicate them well. B. Rosenberg explains that we all have different human needs (such as integrity, intimacy, security..) and when we communicate through these needs, we can clear away any communication blockages, end conflicts and fulfill our human needs to greater happiness and wellbeing. Communicating through our basic human needs and without judgments, manipulation, violence or suppression, makes communication effective because it helps us deeply connect with another human being. I especially enjoyed reading the chapter on anger because it shows an effective strategy on how to transform anger with just our own thoughts. Below are some remarks I wish the author could have emphasized more. - As explained in the book, it's important to be aware of what is going on inside of us before expressing a reply. Even though the author admits that this is a difficult thing to do, I didn't find comprehensive tools on how to accomplish that or even noting that this should probably be a constant and daily practice. Which, myself being a meditation practitioner, I believe getting more in touch with what goes on inside of us really is a difficult daily practice. Taking some time to gather your feelings and order your thoughts before giving a reply (as the author advocates) probably takes a lot of practice before one could effectively use that as a tool in difficult conversations. - The author writes about his experiences with, among others, conflict-resolution. I had hoped to read some examples in which NVC did not work and how to deal with falling back to old ways of communicating and how NVC could be applied in these kinds of situations. Overall, it's an interesting read which (bearing in mind the above remarks) I can recommend to anyone. Before reading this book I suggest you read Nonviolent Communication: A Language of Life, a book about foundations of NVC, and then come back to read this more practical companion. Here you'll get stories from Rosenberg's workshops, role-playing dialogues and stories from his personal life. He really breaks it down into simple steps and shows how much relief and joy people find when they connect with each other from place of empathy and compassion even in high conflict situations and relationships that previously brought them a lot of pain. I want to learn more about how to implement NVC in my life. The steps seem simple but nothing seems easy about this process. We're not educated to think in terms of feelings and needs and the judgmental way we speak and think is always causing problems, but Marshall says that it's not about being perfect, just progressively less stupid and that's something worth keeping in mind. I very much think that the world would be a better place if everyone learned about NVC. Not in the same way that I think it would be a better place if everyone tried chai tea, but like, in an actual way. I want to hold this book like a dear baby. The tenants of NVC are genius but SO SIMPLE. This book contains tons of examples and situational role-playing so that you can see how it really works in real life, which is very helpful. There are tons of clips from Marshall's seminars on YouTube and th I very much think that the world would be a better place if everyone learned about NVC. Not in the same way that I think it would be a better place if everyone tried chai tea, but like, in an actual way. I want to hold this book like a dear baby. pg 145 "I trust a spirituality that leads people to go forward and transform the world, that doesn't just sit there with this beautiful image of radiating energy. I want to see that energy reflected in people's actions as they go out and make things happen. It's something you do, a practical spirituality." I've learned a lot and reflected on my own relationships, communication, and conflicts thanks to this book. I'm not a big fan of the dialog / transcript format though. A motivating read, I see the real value of the book is finding time to practice in our lives. the potential of healing with empathy leaves me optimistic, but also more aware of the omnipresence of suffering in how we've been socialized. Filled with dialogues and helpful examples of the principles of Nonviolent Communication in action, this book makes those principles easier to understand and practice for those of us who do best with stories for learning (for each dialogue becomes a story). Great for small group study. Brilliant,and so very very important. A copy of this book would be an incredibly valuable to everyone-who struggles with communication issues-particularly those folks who think that OTHER people are the ones with the issues. Rosenberg left a legacy of non-violent communication and the importance of using empathy to connect with others. He presents the ability of have power with others rather than over others. He explains how to effectively make an observation, state one's feeling and needs, and make a request in order to get our needs met, while meeting the needs of others. This book is for anyone who is trying to resolve conflict with others, or just becoming more self-aware of one's own needs and feelings. Eu comecei assistindo a um workshop do Marshall e depois li esse livro, que, pelo que eu vi, é uma compilação de outros títulos. Como são vários livros em um, algumas coisas são repetidas, mas eu acho isso um ponto positivo, porque serve pra rever coisas importantes. O texto é bem claro e tem muuita coisa construtiva. This book profoundly changed my life and my perspective. A lot of what he explains in this book were ideas and thoughts that I already had about how violent communication has become. I really believe that everyone should be required to read this to communicate more effectively and to resolve conflicts for the best of everyone involved. Okay book. He gives a lot of examples from sessions he's led in prisons, marriage counselling etc. Basically Rosenberg believes we're not great at communicating our "needs" as opposed to our strategies. We need to practice hearing what people actually mean and use positive present language with one another. I read the intro, part of the romantic partner section, and jumped to the chapter about parenting with NVC. It's a great model. I want to learn more so that I can employ this way of interacting with others, especially my toddler. Fantastic book with helpful dialogues. I can't wait to read more of Marshall Rosenberg's books. A Book I donated to Veteran's Administration Hospital ! Of the two books I prefer the first one but I enjoyed reading this one because there is so much to take in and rewire in your thinking to be able to live out NVC. For me, reading this had more to do with me being aware of the objections that would come into my mind when a certain concept of NVC was being revisited. I still feel like I have a long way to go before I can live out NVC as much as I want to. There was a lot of repeated material, mostly illustrations, from the regular NVC book, so I did Of the two books I prefer the first one but I enjoyed reading this one because there is so much to take in and rewire in your thinking to be able to live out NVC. There was a lot of repeated material, mostly illustrations, from the regular NVC book, so I did find myself scanning over them if I remembered them. Most enjoyable was probably the spiritual reflections chapter at the end where you get to look into some of the origins and thinking which created NVC for Marshal. I liked that a lot and he makes some important comments about how its not so much about the NVC method as it is connecting to the divine energy in ourselves and others - that is the goal and if NVC helps us do that then great! but it's not necessarily about just following the "NVC method" or "NVC technique." The parenting section was also very intriguing. I felt like the anger section was already pretty much a part of the first book though. This book was one of the recommended readings from "More than Two". It certainly has helped me look at situations in a different way, trying to read the need behind people's expressions - in Marshall's words, "judgments are tragic expressions of unmet needs". I especially liked the section on managing anger, which went through identifying the stimulus and the cause and recognising they are separate from one another. I've learnt not to say "I'm angry because you.." but "I'm angry because I..." which, again, requires looking inwards at my own needs which are not being met. The nonviolent approach is very practical in terms of being relatively straightforward to introduce to others. However, implementing it in one's life can be challenging because to do so requires a person not to be hijacked by their fear/anger circuitry, and to be genuinely interested in achieving mutual understanding. So often, people have strategic / power agendas OTHER THAN coming to mutual understanding with another human being. I don't remember why this author was recommended, but it was the author, and I picked the book title that sounded most useful. I didn't realize that this was a supplemental volume until about 3/4 of the way through; I was pretty frustrated that he wasn't explaining concepts and thought he was a pretty terrible communicator. I will read the other book; I feel like there could have been great info here but out of order it wasn't very useful. Doh. The premise is good but the dialogues read as made-up and hokey just to prove the point being delivered. Maybe this is a book for people who've never ever read a single self-help book, but I found it incredibly simplistic. Consider The Four Agreements instead. A much shorter and to-the-point book without all the pseudo-pithy dialogue. this book is invaluable. the best gift you can give to yourself (and to the world, really) is to read this book. no joke. please do it. incredible insight as to why communicating is often difficult when we so desperately feel it needn't be, and how to ease some of the barriers that hinder us from more fully connecting with others. I have taken a lot of good from this book. I don't know that I can apply it to the personality type of INTJ, which is prominent in my life. Applying it to my own life and outside relationships will take practice but I am certainly going to try. I love the concept! A very good follow on book to his main book, Nonviolent Communications. This is a challenging practice so this provides good scenarios. The new CEO of Microsoft highly recommends NVC so we'll what difference it might make there. There was only one chapter in this book that didn't tick me off, and that was the one about kids. I learned halfway through that is it a companion book, so I will go to the source material before judging too harshly. It revolutionized the way I communicate with my wife, friends, and myself. Inderdaad een prachtig doe-boek, een manier van denken-communiceren die de meeste mensen niet gewoon zijn te doen. Een absolute aanrader!! In 1961, Rosenberg received his Ph.D Marshall Rosenberg was an American psychologist and the creator of Nonviolent Communication, a communication process that helps people to exchange the information necessary to resolve conflicts and differences peacefully. He was the founder and Director of Educational Services for the Center for Nonviolent Communication, an international non-profit organization.